During the heart of the Cold War, tensions between Russia and the United States are the highest they’ve ever been. Both sides are on high alert for spies looking to share secrets with the other side. When Rudolf Abel (Mark Rylance) is arrested for being a Russian spy, it is important for the case to at least have the appearance of being fair. James Donovan (Tom Hanks) is a partner at a law firm. His case work now primarily involves insurance cases. When the CIA approaches Donovan to defend Abel, he really has no choice but to accept. The trial against Abel should be an open and close case. It will be an easy “win” for Donovan. Abel will be quickly convicted and Donovan can move on. However, as he gets further into the case, Donovan’s ethical side takes over. He does everything he can to represent Abel to the best of his ability. This makes Donovan one of the most hated men in America. Even when he is forced to go to Germany to negotiate a trade to exchange Abel for a captured American pilot, Donovan does not give up, even when his own life may be in danger. 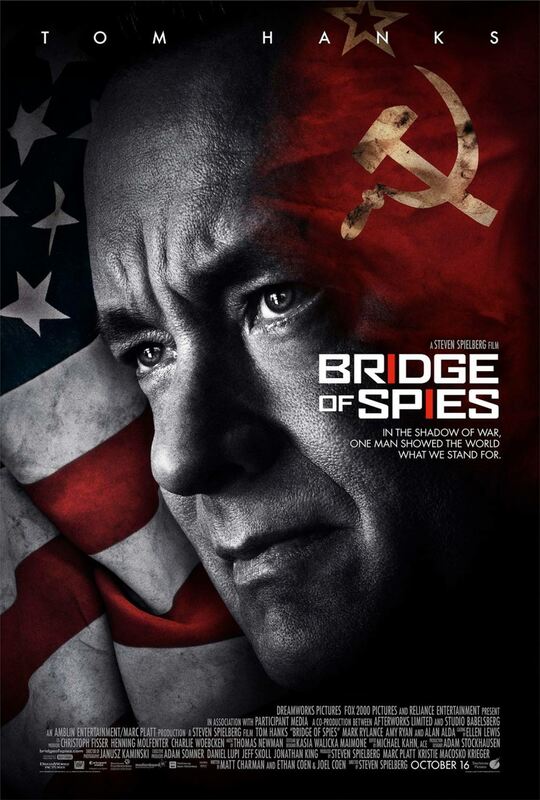 Bridge of Spies is based on a true story that took place when the tension between the Eastern and Western countries was at its highest ever. Both sides feared the other. Germany was building the Berlin Wall. Nuclear war was almost imminent. Tom Hanks does what Tom Hanks does best in this film. He plays the good guy who won’t set aside his beliefs, even in the face of danger. Hanks gives an air of credibility to the character that few others can. I don’t want to discount the rest of the cast, as they are all add to the film. But, honestly, the film is first and foremost about Hanks’ character. The backdrop of the story is the brutal world that was built during the Cold War. For the younger crowd who may not remember what this time was like, it may seem like an exaggeration. For those, like me, who can remember the tail end of this era, when the Berlin Wall came down, it’s not at all a stretch to realize that these were the harsh realities of the time. The film captures the feeling of how difficult a time this was. Director Steven Spielberg is very familiar with this subject. He and Hanks have been down similar roads a time or two before. They handle it with a touch only two consummate professionals like them can. As with almost all Tom Hanks films of late, Bridge of Spies clocks in at a hefty 2 hours and 22 minutes. Surprisingly, however, it doesn’t feel long. The story keeps you engrossed and the pacing keeps things moving along at a good pace. It provides a glimpse back at a mostly forgotten time and tells a compelling true story. I would expect to hear a decent amount about this film come awards season.